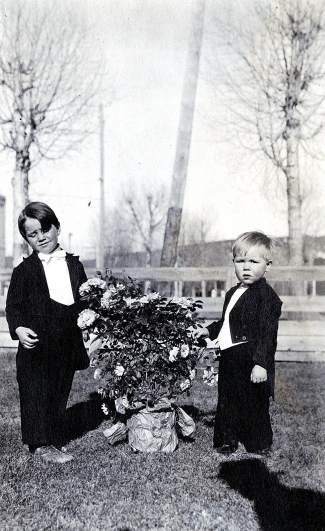 Two unidentified Eagle boys are dressed up for a special occasion in this 1920s era photograph from the Lewis family collection. The Rock Creek Fire Department was formed under the direction of Chief Brita Horn. The fire departments volunteers had completed 40 hours of training, including CPR classes and radio operation instruction. Ricardo Zamora was honored as ECO Transit’s 1 millionth rider. He received an annual pass and a new pair of Solomon skis and boots, courtesy of KZYR and the Snowboard Outreach Society. Local residents watching ABC news caught a glimpse of native son, Lt. Col. Dave Mott. Mott was stationed in Kyrgyzstan and he sent a cheery holiday greeting to his parents, Dave and Sue Mott of Wolcott. Oralia and Ignacio Archibeque celebrated their 50th wedding anniversary. Jason Feucht and Erica Moffatt announced their recent marriage. Eagle town leaders planned a Broadway remodel to keep downtown Eagle a viable central business district. Eagle County inked three-year agreements with four of its major air carriers, continuing direct 757 nationwide airline service through the 2007 ski season. Eagle Police received a report that a dog had attacked and killed domestic rabbits at a residences on Wall Street. An officer found the dog still roaming around with the remains of the three dead rabbits. The Eagle Cyclones soccer team — a group of boys age 12 and younger – earned the title for their age group in the Western Slope Soccer League. The Johnson family in Eagle donated a conservation easement on the 60-acre Elinor Allen tract along Brush Creek. The easement recipient, the Eagle Valley Land Conservancy, noted the donation ensured the tract would remain as open space in perpetuity. The Eagle County School District was looking at short-term solutions to deal with over-crowding at several schools. Eagle Valley High School graduates Nicole, McPherson, Lisa Dyck and Renee White placed well at a National Cross County Championship in Kenosha, Wis.
Bethe Wright opened an insurance business in Eagle. Buffalo chili and a performance by the Vail Precision Lawn Chair Demonstration Teams were among the highlights at the Christmas on Broadway celebration. The Eagle Town Board voted to hire a consultant and write a letter to the U.S. Postal Service in an effort to keep the Eagle Post Office downtown. The Eagle County commissioners voted to allow Glen Miller Enterprises, the new owner of the Eagle Mine in Gilman, to continue extracting ore from the mine without reapplying for a special use permit. However, the county said the company would have to get a permit to begin milling and processing the ore. There were 83 applications for the Eagle town manager job. Manager Susan Sanfillippo resigned the position to take a job in Cortez. The second set of traffic lights in Eagle County was installed at Avon Road and U.S. Highway 6 in Avon. In other news from that community, Bruce Hasbrouck was the town’s newest police officer. The Eagle Business and Professional Women planned a Christmas home tour featuring the Goldman, Bolt, McRory, Isom and Lovell residences. The town of Gypsum applied for a federal grant that would provide law enforcement services in the community. 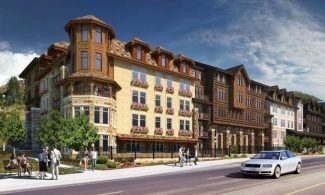 The grant would fund a joint venture between the town and the Eagle County Sheriff’s Office. Christian Lawless Harper, a man who escaped from the Eagle County Jail in October, was arrested in California after he stole a Cadillac from a car dealer. 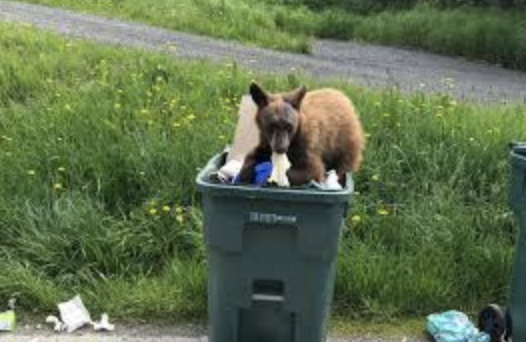 Eagle County Sheriff Jim Seabry and Undersheriff Tom Davis were somewhat worse for wear after responding to a wildlife complaint. The two men were called in to assist with a pair of bucks with locked antlers. When they arrived at the Horse Mountain location, they found a dead, four-point buck with antlers locked to a “very much alive” five-point buck. After assessing the situation, Davis stood on the horns of the dead animal and held the antlers of the live buck while Seabry attempted to cut through them with a hack saw. The deer allowed Seabry to make three cuts and then chose to suddenly lunge forward, catching Davis’s fingers and pinching Seabry’s stomach. Eventually the bruised officers used a winch on their vehicle to free the deer. The wedding announcement of Starr Grahler and Duston Walls appeared in the Enterprise. The couple married Oct. 20 at First Lutheran Church in Gypsum. Anxious businessmen in the new ski resort of Vail brought in 15 Ute Indian dances to perform a snow dance on the rather dry ski slopes. Eagle County School District voters approved a $700,000 bond issue for a new high school at Maloit Park, south of Minturn, and a four-room addition to the elementary school in Eagle. 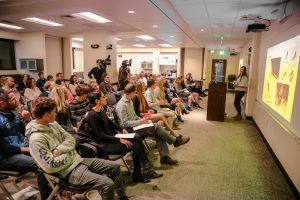 Students in the advanced social studies class at EVHS staged a mock trial at the Eagle County Court House. Martha Simmonds played the defendant and Pat Carlow was the defense attorney. Kevin Doll was the prosecutor and Joy Claywood performed the duties of judge. The witness list included Mike Knupp, Karen Steward, Buster Orr and Tom Rule. The jury consisted of Jane Nottingham, Julie Tolbert, J.L. Mayes, Chuck Woodward and Danny Walcher. The defendant was found guilty. The case narrative had the defendant, an exotic dancer at Nick’s Bar and Grill, accused of the fatal shooting of her employer when he discovered her stealing $250 from the office safe. Lucille and Denny Eaton hosted a grand opening for the new Serv-U-Shop in downtown Eagle. The Eagle Lions Club and the Independent Lumber Company teamed up to organize a special visit from Santa Claus. The event began with the airplane arrival of Santa at the county airport. Father Christmas handed out toys to the kids in attendance and a free movie matinee was shown at the Eagle Theater. The Eagle County Speech Contest was planned at the Eagle Gym. 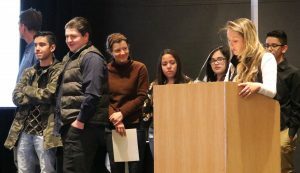 Competitors from the six high schools in the county — located in Eagle, Gypsum, Minturn, Red Cliff, McCoy and Basalt — were slated to perform in four divisions: formal oration, monologue, extemporaneous speech and poetry. The county’s Christmas Seals tuberculosis campaign was under way. The featured movie at the Eagle Theater was “Column South” starring Audie Murphey, while the Crystal Theater in Carbondale was showing “Law and Order” starring Ronald Reagan. Eagle County District Attorney Harold A. Grant was stationed as a yeoman first class with the U.S. Navy in Tiburn, Calif. The Thatcher twins, Warren and Wallace of Sweetwater, were both in the convoy service. Warren had recently landed in England and Wallace was serving in the South Pacific. Mrs. L.W. Robidoux won first place for her canned apricots at a meeting of the Gypsum Home Demonstration Club. Anticipated heavy holiday traffic, particularly from the Camp Hale area, prompted the Rio Grand Railroad to extend train service between Pueblo and Glenwood Springs. Five carloads of cotton seed cake were in the first shipment of freight over the Dotsero cutoff, although the line was not officially opened. The Eagle Chamber of Commerce hosted a “Ladies Night” and each member was asked to bring his wife, sweetheart or “some other lady” to the gathering. The Dreamland Hall at Wolcott advertised plans for a Carnival Dance. “Celebrate the big holiday season of the year right. Horns, confetti, streamers and everything to make a big dance.” Admission was $1 with music by the Purple and Gold Orchestra. The only information missing from the advertisement was the date of the event.